To start writing an Insight on Smartkarma, click on the “Compose an Insight” button at the top of your screen. 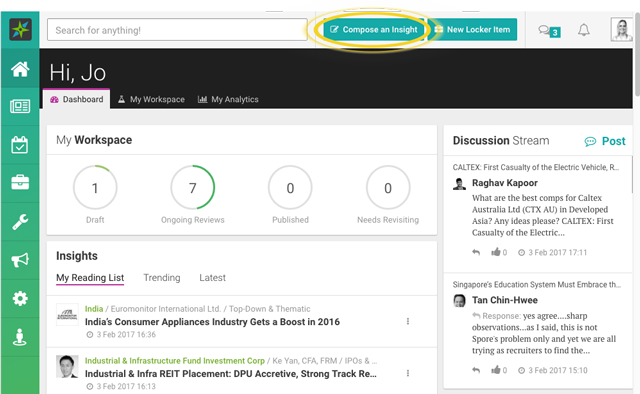 After clicking on the "Compose an Insight" button, an Insight creation page will appear. Here, you will see the Insight split into three sections: a Headline, an Executive Summary, and Detail. Once you start writing in the Executive Summary or the Detail section, you will see a toolbar appear at the bottom of your screen. You can change your font type to clearly segment your Insights. Highlight the text that you wish to format and change it accordingly. Here are some examples of the different font types you can use to format your Insight. You can add bullet or numbered points by using the third or fourth icon from the right on the yellow toolbar. You can also increase the indentation of the bullet points to make them sub-points. Paragraphs may also be increased to align them under the same sub-point if necessary. The indentation buttons are at the far right on the yellow toolbar. As you would in a Microsoft Word document, you can Undo or Redo your work whenever you want to. You can do all these through a series of shortcuts. Inserting a link in your Insight works the same as it does on Google mail. First, copy the URL of the page that you want to link to. Next, type the text you want to display for the URL you are linking, highlight the text, and click on insert a link in the yellow toolbar. Upon clicking on the insert link icon, there will be a pop-up prompting you to enter the URL. Click ‘OK’ and you should see your text hyperlinked (light blue and underlined). Ensure the image is saved on your computer. Click on the second icon from the left on the yellow toolbar at the bottom. A small pop-up will appear, and you should click on the ‘Choose File’ button. Navigate to the folder where you have saved the image in (in this case, we choose the file titled "Screenshot") and click Open. The pop-up will now show the name of the image you have selected. Now, click Insert (adding a caption in the caption field if necessary) and the image will appear in the body of your Insight. Since we encourage you to add in charts and pictures to elaborate your points, another essential tool you could use is the Snipping Tool, which helps you screenshot and save images. We do not provide in-built snipping tools on Smartkarma, so you will have to use your computer’s default tools to save images before uploading. Below, we briefly teach you how to save images using default tools. Snipping Tool is a default Windows app, and all Windows users should find it on their PCs. For Mac users, you should have an app called Preview on your dock which performs the same role but keying “COMMAND+SHIFT+4” gets you a screenshot clipping tool quickly. For Windows users, go to search, type in ‘Snipping Tool’ and open it. You should see a small window appear on your screen. To start snipping images, open the image that you want to snip in the background (just behind the snipping tool) and click on New. The background you want to snip will turn translucent and your mouse will turn into a crosshair which allows you to snip any part of the background. After snipping the image, click on the floppy disk icon to save the image onto your PC. For Mac users, the snip you take with Preview will be automatically saved on your desktop. Build your chart using any spreadsheet software such as Microsoft Excel or any chart building tool and snip it using the steps above under ‘How to Add Screenshots to Your Insight'. Make sure you save the image onto your computer and insert the image onto the Insight using the steps in ‘Inserting an Image’. It is a good idea to rename your screenshot to make it easy to recognize for posterity. There are two ways to insert a table in an Insight. The first is by copying data from an existing Excel file and pasting it into the Insight. The data will automatically show up in table form, but you will still be able to make changes inside the Insight. You can still add in rows and columns into the table using the white toolbar just below the table. The second way to insert a table into the Insight is to create the table from scratch. Click on the table icon (fourth from the left) on the yellow toolbar and go to "Insert table" and choose the dimensions. You can tag companies, Insights, and other Insight Providers in your Insight. The purpose of Tagging is to make reading an Insight more convenient and promote collaboration between Insight Providers. Type in the @ symbol and you will be prompted to type an Insight Provider’s name. Once you start typing in the name of the Insight Provider, you will see a few names suggested. Select the Insight Provider you wish to Tag from the drop-down menu and a hyperlinked name (light blue and underlined) will appear in your Insight. Type in the # symbol and you will be prompted to type the title of an Insight you wish to Tag. Starting to type the title of the Insight you wish to Tag will suggest a few Insights. Select the Insight you wish to cite and the hyperlinked Insight (light blue and underlined) will appear in your Insight. Type in the $ symbol and you will be prompted to type the name of the Entity you wish to Tag. Starting to type the name of the Entity will show you a few companies you could Tag. You can also use the company’s Bloomberg ticker to search for the Entity. Select the Entity you wish to tag from the dropdown and the hyperlinked company name with Bloomberg ticker (light blue and underlined) will appear in your Insight. You can 'embed' external content on Smartkarma. Common external content embedded on Smartkarma may be presentations from Slideshare or YouTube content, which we show below. To embed a video or a GIF, click the Embed button to find the embed URL from the website hosting the content. For YouTube videos, click on the ‘Share’ button, and then click on ‘Embed’ and copy the code. Move back to your Insight and click on the third icon from the left of the yellow toolbar and a pop-up will appear, prompting you to paste in the embed code. Paste the code you have copied from YouTube and click ‘Ok’. The YouTube video will appear in your Insight. You can use the attachments section at the bottom to add pdf documents or Excel files. You can either drag and drop the files into this part of the screen or you can manually click on thegray box to select files to upload. Once you have selected files to upload, you can choose to display the first few pages of your attached documents by selecting the flag icon. This will provide the readers with a preview of the first few pages of your pdf documents at the end of your Insight. We have also developed our own in-house tools to aid our Insight Providers with idea generation, by providing objective data-driven views on M&A transactions, IPOs and placements. These tools are accessible from the menu bar on the right. You can come back at a later time and continue to write from where you left off, as we automatically save each Insight frequently. However, it’s always a good idea to save your Insight using the save button in the top right-hand side corner. You should see a green tick once your Insight has been saved. A progress bar on the right will indicate your progress through the writing and publishing process, and provide you with an idea of how far you still have to go.